With the G8 summit in full swing in Northern Ireland, the world’s leaders try to tackle financial and international challenges including tax evasion, the Middle East stand-off, the Syrian crisis and the North Korea nuclear problem. 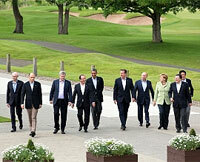 G8 leaders began their two-day summit at the Lough Erne golf resort in the southwest of Northern Ireland on Monday, June 17. Their negotiations are taking place at a five-star hotel, complete with a conference hall accommodating 400 and a golf course. The Lough Erne summit’s host, British Prime Minister David Cameron, wants the G8 leaders to think back to the forum’s origins. Originally, leaders of seven countries gathered at the Rambouillet castle in 1975 on the initiative of the French president, for a “fireplace chat” that resulted in a declaration consisting of just 15 points. Almost 40 years later, Britain, the summit’s organizer, is taking the forum back to its founding principles ­ no extensive communiqué, long motorcades or armies of officials accompanying the leaders. The G8 leaders are calling on one another to assume responsibility for transforming their good intentions into concrete steps to strengthen peace and develop the global economy. Since those steps have a medium-term outlook, in order to maximize the positive effect, Britain will have to cooperate more actively with Russia, which will assume the G8 Presidency in 2014. Therefore, it is not surprising that Cameron’s first meeting at the summit’s margins is with Russian President Vladimir Putin. According to Cameron, the summit’s economic agenda is focusing on the three T’s ­ tax, trade, and transparency. “Those are the issues we are going to be driving for this year,” the British prime minister said. He expects the G8 to achieve a breakthrough in global trade talks, including trans-Atlantic trade, a partnership within the EU and sweeping away bureaucratic customs formalities at international borders. Even so, Cameron attaches even bigger importance to coordination between the G8 members on fighting tax evasion and exchanging information on corporation owners. He told journalists ahead of the summit that truly active measures to combat tax evasion were required, an information exchange system needed to be created and new standards for control over corporations to be established. The summit’s political agenda includes countering international terrorism, ensuring non-proliferation of weapons of mass destruction, and combating illegal trafficking in conventional arms and regional conflicts. Special importance is attached to the British G8 Presidency’s initiative on preventing sexual violence against women and children during armed conflicts. Sergei Lavrov, this problem must be resolved primarily on the basis of the resolutions on violence that have already been adopted by the UN Security Council and General Assembly. “Equally serious attention must be paid to other negative implications of armed conflicts,” Lavrov said. The summit is reviewing in detail the two-year-old conflict in Syria, which has claimed more than 80,000 lives. Despite a number of differences, Moscow and Washington are applying their best efforts to call an international conference on Syria and establish a dialogue between the Syrian government and the opposition. Evidence of use of chemical weapons in Syria features on the agenda for Vladimir Putin’s meeting with U.S. President Barack Obama at the margins of the summit, U.S. Ambassador to Moscow Michael McFaul said last week on June 13. The summit participants are also condemning the North Korean intercontinental ballistic missiles and nuclear program. British Foreign Secretary William Hague said that, if North Korea conducted another missile launch or nuclear test, he was ready to take serious steps toward that country’s further isolation. Russia, on the other hand, categorically opposes using North Korea’s actions as a pretext for a military build-up in the region, pumping it full of weapons, deploying missile defense systems or taking other actions going beyond the scope of neutralization of the threat actually posed by Pyongyang’s missile and nuclear programs. In Moscow’s opinion, the solution should be sought by using political and diplomatic tools and moving toward a resumption of the six-party talks that include Russia, China, North Korea, South Korea, the United States, and Japan. A political dialogue rooted in the principles of a phased approach and reciprocity could also serve as the basis for settling the situation surrounding Iran’s nuclear program. Russia believes that the recent talks between six international intermediaries (the five permanent UN Security Council members plus Germany) and Iran in Almaty and Istanbul suggest that such a dialogue is possible. The West, meanwhile, pins the lack of progress at the talks on Iran’s delaying tactics against a background of continued development of its nuclear technology. The summit is expected to arrive at a mutual understanding on the issue of a Middle East settlement. The G8 foreign ministers have acknowledged that the deadlock with respect to Palestine is clearly overdue for a solution and that practical steps should be undertaken to restart the negotiation process between the Palestinians and the Israelis. They are in favor of an urgent meeting of international intermediaries on the Middle East conflict. Moscow also insists on engaging Arab countries, as well as Israel and Palestine, in the proceedings of the Quartet on the Middle East (Russia, the U.S., the EU and the UN). Whether all those provisions will make it into the final communiqué depends, however, on how the discussions go between the forum participants.